Many higher education institutions, like the University of Washington (UW), are implementing large, complex, Software-as-a-Service solutions for HR, payroll and other administrative systems. While these enterprise systems provide useful new tools and resources, organizations face a significant challenge in helping users understand what’s changing and how to prepare for that change. The UW is in the process of replacing its 30+ year-old HR and payroll system with a Software-as-a-Service human capital management tool. This multi-year effort is the largest administrative transformation in UW’s history, touching every person and department at the University. 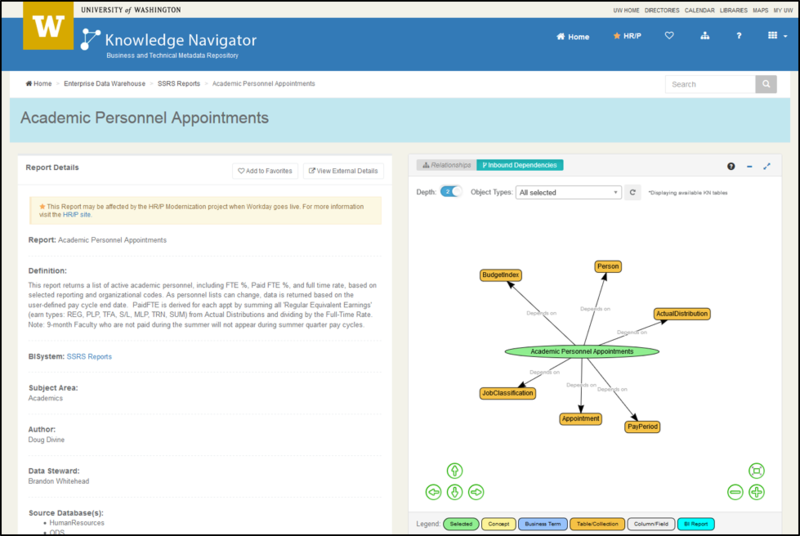 Knowledge Navigator (KN) was created as a metadata repository and to facilitate system migration. 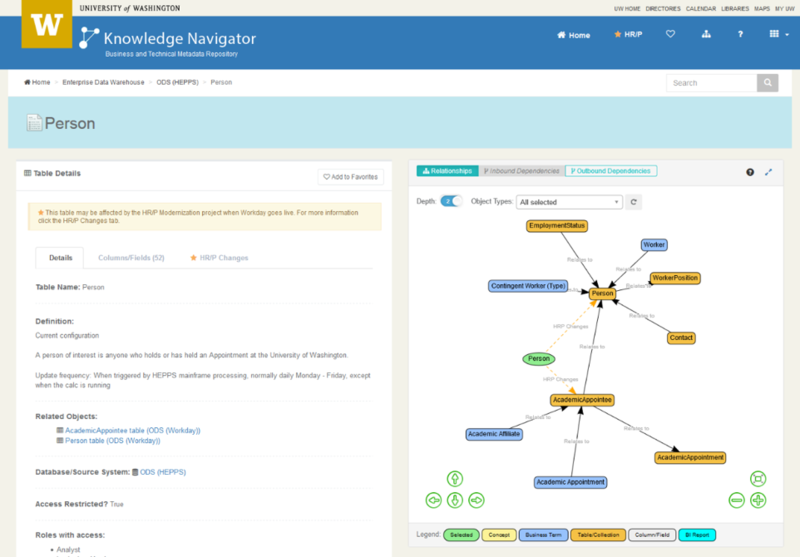 KN represents concepts and data relationships both visually and textually, highlighting linkages between the old and new systems in a web-based, interactive platform as seen below. KN keeps users informed and engaged throughout the enterprise system migration by providing self-service access to conceptual and technical descriptions, definitions, lineage, interactive relationship maps, and impact analysis information. 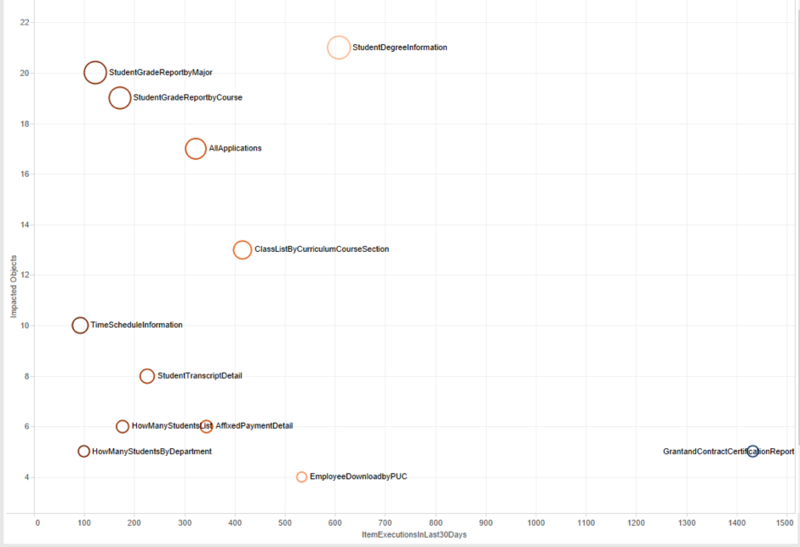 When effectively governed, a metadata repository establishes a common understanding and expectations across the University. It provides a view into the flow of data, the ability to perform impact analysis, a common business vocabulary and accountability for its terms and definitions. The comprehensive management of metadata is vital to enabling an organization to oversee changes while delivering trusted, secure data in a complex data integration environment. Solid metadata management tools play a central role in holistic system management, including system migration. Multiple metadata solutions have been evaluated, from custom SharePoint repositories to custom relational database (RDBMS) solutions to commercial vendor tools. None worked well, nor offered the amount of customization required, and they did not provide the ability to “stitch” together various data sources into a complete before-and-after picture. 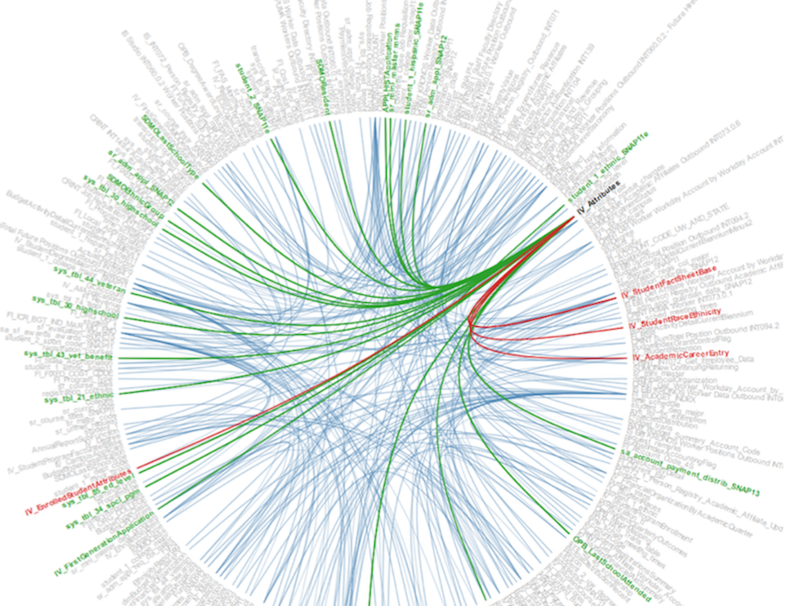 In 2014, at a national information management conference, the University of Notre Dame presented on graph databases. Through a subsequent collaboration with them, the UW team was inspired to move to Neo4j as the database of choice. 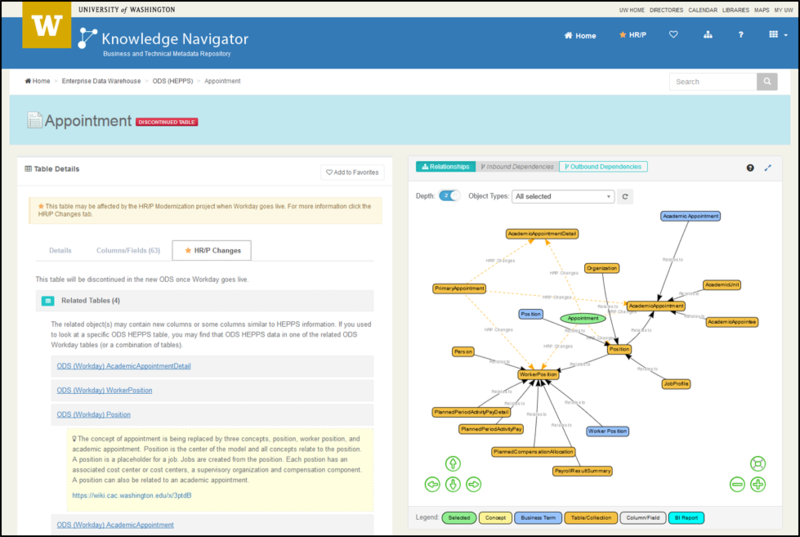 Knowledge Navigator stands out among metadata repositories because of its unique ability to provide communication about changes to the University’s data end-users. Built into KN is help for understanding the impact of migrating from a mainframe system to a cloud-based system, and how to prepare for the changes. Data lineage maps illustrate the parallels between the old and new systems. Interactive diagrams invite users to select objects and artifacts to understand the relationships between them. KN explains the new concepts and definitions users should know to work effectively within the new system. 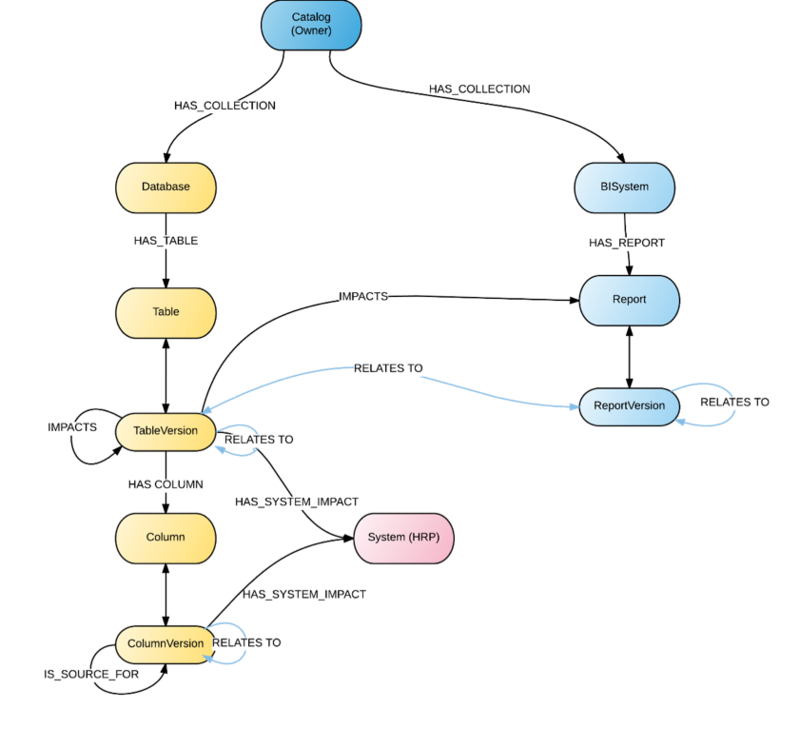 Users can view high-level conceptual models as well as technical metadata about tables and columns. For example, users can see that the legacy table called Person is related to Person in the new system, or that 14 columns from legacy Person relate to columns in the new Person, and that there is a brand-new, yet related table, called AcademicAppointee. KN identifies affected tables and columns in the reporting operational data store, as well as affected business intelligence reports. In the screenshot below, all source tables are displayed for the Academic Personnel Appointment Report. Looking ahead, on the heels of the HR/Payroll Modernization (HRPM) program, the University will replace its equally outmoded finance system. The Finance Business Transformation (FBT) program promises to be even larger and more complex than HRPM, and we are already working with FBT leadership to plan the data that will go into KN to facilitate impact analysis and user guidance throughout the project. In addition, KN is used by internal project teams to document metadata used in the development process and not accessible to the general public, such as: internal glossaries and databases, internal notes and links, and source-to-target mappings of databases, APIs and other data sources. Likewise, new data buildout projects benefit from the exposed source-to-target mapping and data transformations. Developers and testers save time and effort through ready access to these critical underlying details. 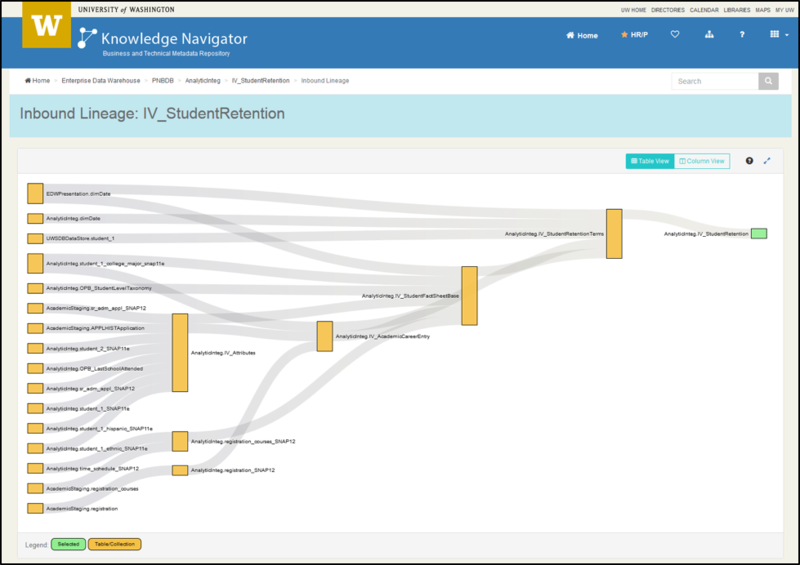 Knowledge Navigator has become an essential tool for data users and metadata repository managers to understand the meaning, usage and impact of data and business concepts at the University of Washington. Using Neo4j as our database, we are well-positioned to expand its capabilities to include the metadata necessary to build it into a powerful enterprise tool. 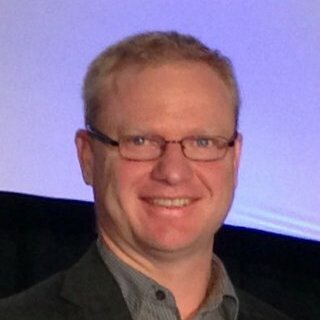 Has the code used to build the application framework become opensource? Very interesting. How are you populating the database? Also wondering if the application framework is opensource.